Mera Peak (6,476 m/21,247 ft) is the highest trekking peak Nepal that offers astonishing panorama of five highest (above 8,000 m) peaks in the world. Residing in the home region of 5 of world’s 8,000 meter peaks; Mt Kangchenjunga, Mt Makalu, Mt Lhotse and the highest Mt Everest along with Mt Cho Oyu; Mera Peak is classified as a trekking peak. Mera peak is often divided as Mera North (6,476 m/ 21,247 ft); Mera Central (6,461 m/ 21,198 ft); and Mera South (6,065 m/ 19,898 ft). 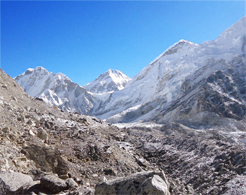 Mera peak rises the south of Everest considered as one of the major and well known peaks in Nepal. The area is among less frequently visited places where you may find many undisturbed region of Nepal and wide canopy of dense forest on hills. There are several approaches to Mera Peak Base camp besides the normal easy route. Trek from Lukla to Chutanga(3050m),4-5hrs trekking. Trek from Chutanga to Tuli Kharka (Chatra-La) (3900m),5-6hrs trekking. You trek via Zatrawa La Pass (4610m) and downclimb to Khartitang at 3900m. Trek from Kothe to Tangnang (4,350m),4-5hrs trekking.We will enjoy fantastic view of south face of Mera Peak throughout the day. Trek from Tangnang to Khare (5,045m),4-5hrs trekking. Trek and climb from Khare to Mera Base Camp (5300m)4-5hrs trekking. Mera High Camp to Summit (6,654m) and return to Khare. Trek from Khare to Kothe (3600m),4-5hrs trekking. Trek from Kothe to Thuli Kharka,4-5hrs trekking. Thuli Kharka to Lukla: via Zatrwa La pass. Early in the morning fly from Lukla to Kathmandu, which takes about 35 minutes, transfer to hotel. Drop you off at Tribhuvan International Airport by private vehicle. * Round Trip( KATHMANDU-LUKLA- KATHMANDU) Flight fare for Guests & Guide with all taxes. * NMA Climbing permit for Mera peak and Trekking Permit and TIMS card will be provided. * Hot Shower, Battery Charges( Available in Trek with Extra cost or Free in some lodges). * Unforeseen Cost such as Flight Cancellation or Delayed, Sick in Trek, and Helicopter rescue in Trek. Cost due to bad weather etc which is out of our control.